I bet you're all starting to think that I only make Seamwork patterns. They sure have been a trend in my recent sewing! Something about fresh patterns delivered monthly makes me very happy. In this case, the Astoria was one I initially overlooked, but with a push from some fellow sewists I went for it. The Astoria is a close-fitting cropped knit sweater, with a high neckline. It's meant to be a layering piece, so it's perfect for throwing on over dresses in the fall. It's not exactly a part of my normal silhouette (I usually gravitate towards looser cuts and lower necklines) but recently I found a need for a close-fitting (read: more polished) item in my closet. 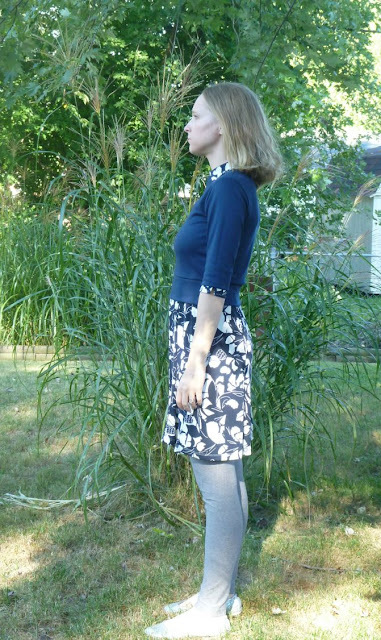 I have a few "fancy" knit dresses that just don't look right with a sloppy, oversized cardigan. When I toss on this Astoria I instantly feel more put-together. 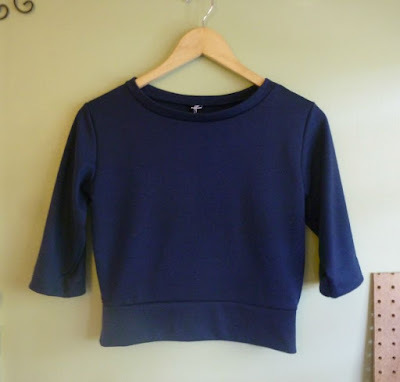 The fabric is a navy ponte from Girl Charlee. It has a slight sheen to it, which also means it looks less casual. I made a size small based on my bust measurement, with no adjustments, and the fit is perfect. I have a large bust for my frame since I'm currently nursing, but with a cropped sweater it means no bagginess everywhere else. I normally have to make an adjustment for narrow shoulders but found this one fit fine. If you have broad shoulders double check your fit. The only issue is that the neckline binding is just a smidge too long. 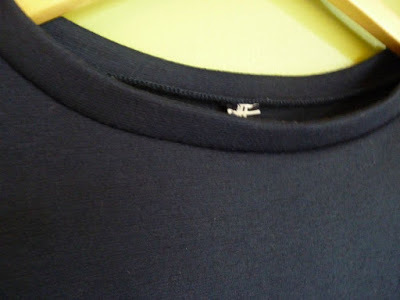 That's all dependent on the stretchiness of your fabric, so it may not be a problem with any other versions. I do recommend adding a tag to the back of the garment, since it looks pretty similar front to back. The dress I'm wearing underneath is RTW, from Old Navy a gazillion years ago. The leggings are me-made (blogged here). I LOVE how well-defined my waist looks in this sweater, the band on the bottom definitely gives the visual that it's nice and narrow. 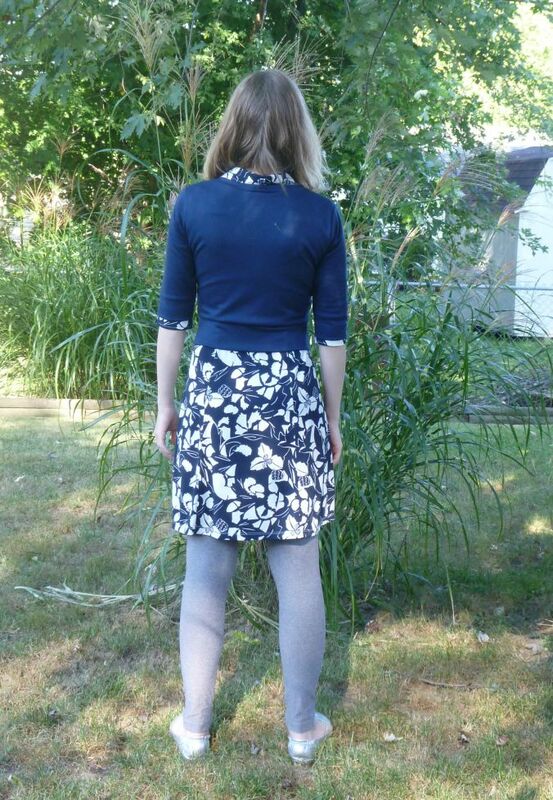 Unlike some other Seamwork patterns I've made, this one did only take the 1 hour stated by the pattern. 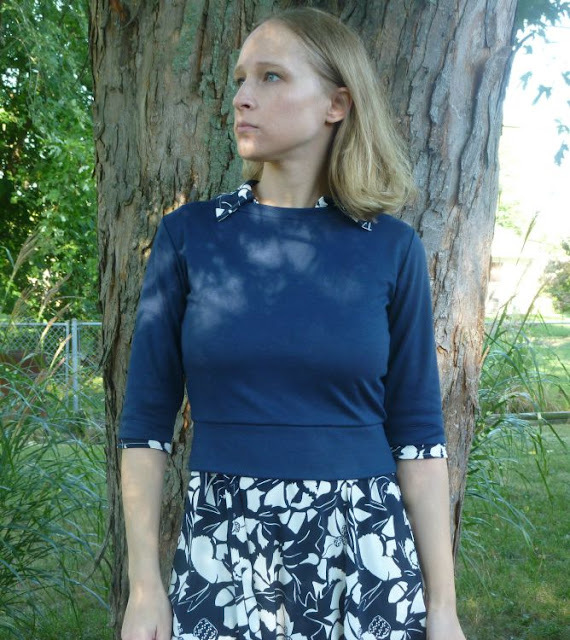 It's a super fast sew and I highly recommend it if you have the same kind of hole in your closet that I did. I used my serger for the whole thing, other than tacking down the loose serger threads (rather than weaving them back in or tying a knot). I just made a bartack at the end of each sleeve seam. Stay tuned next week for the whole reason why I was sewing this up in the first place...it has to do with a HUGE blog tour with a TON of prizes, including one of my Sewist's Notebooks AND a Janome sewing machine!